In this activity, students work in pairs. Step 1: Get supplies and print worksheets. This should make enough lava for about 15 groups. To make thick lava, watch this video to see how we mix up a batch in a plastic bag without making a mess. You can also mix your lava in a mixing bowl. To make thin lava, we use plain water (or water with a drop or two of food coloring). In this Mystery, students will investigate how differences in lava types explain differences in the shape and eruption patterns among volcanoes. In the activity, students will experiment with “lava” of different thicknesses to solve the mystery. 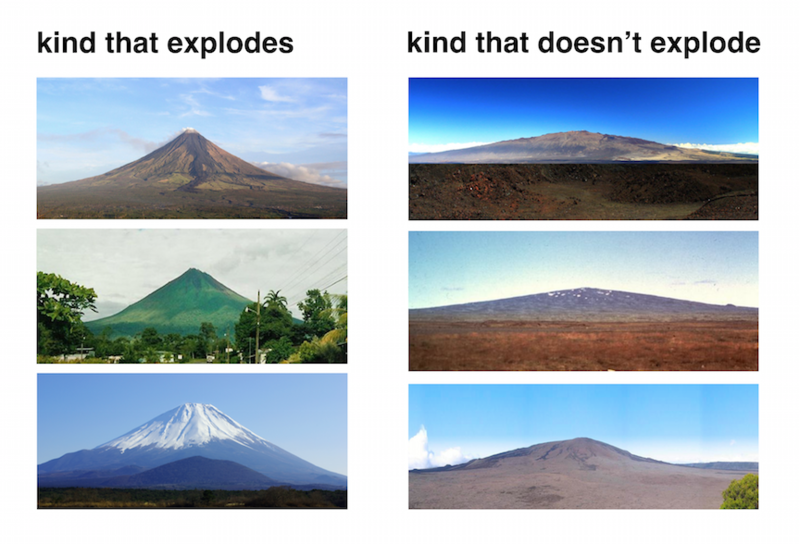 Here are some examples of each kind of volcano. What do you notice about the shape? 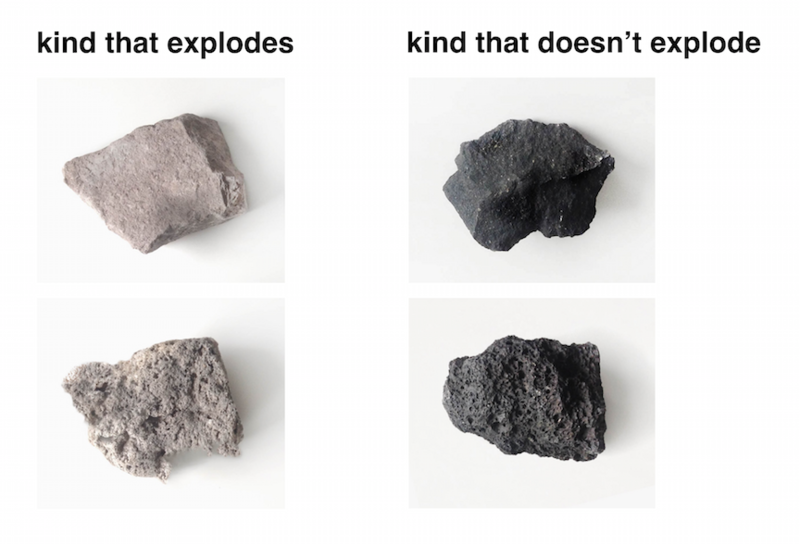 Here are a couple of rocks collected from each type of volcano. What do you notice? Video: Molten Paradise — The first 10 minutes of this video from USGS shows spectacular footage of volcanoes in Hawaii with commentary from the scientists who study them. Reading: A reading about lava in English and Spanish, free with registration on Newsela Elementary. This week in science we continued our study of volcanoes. Your child learned about different kinds of volcanoes and how the thickness of the lava can explain the shape and eruption pattern of the volcanoes. Using lava made out of water and flour, they tested how different lavas create different shapes and trap gases differently. We solved the mystery, “Why do some volcanoes explode?” You can support this week’s learning by watching this high definition video of lava flowing in Hawaii with your child: http://safeYouTube.net/w/iel. See if you can figure out the shape of the volcano that’s producing the lava. (hint: the lava is pretty thin so it doesn’t trap the gas very well.) Good luck!